Ever since Albert Einstein published his theory of general relativity in 1915, predicting the existence of black holes, it was thought they devour everything in their vicinity, including light. Black holes, it was thought, were bottomless pits from which matter and energy could never escape. But Hawking, sometimes described as the most influential theoretical physicist since Einstein, questioned this, saying that black holes were not really black at all and must emit particles. In so doing, he touched on a persistent headache for physicists: Einstein's theory, which has withstood every experimental test so far, does not explain the behaviour of particles in the subatomic, "quantum" sphere. Considered controversial at first, Hawking's black hole theory pointed to a possible bridge between the two mainstay physics theories—general relativity and quantum mechanics. 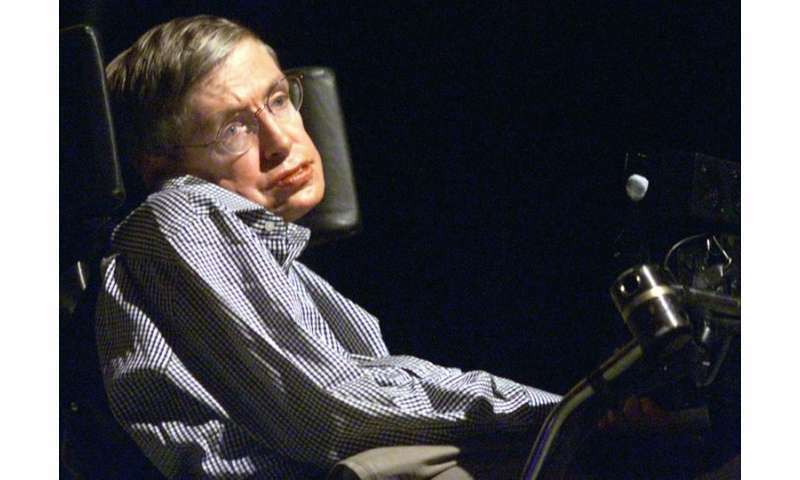 "Hawking realised that black holes, these objects that are made of gravity, because of quantum mechanics... can actually emit particles," astrophysicist Patrick Sutton of Cardiff University told AFP. "This was the first case where we had a physical process that links gravity, this classical theory of gravity, with quantum mechanics." The mechanism was named "Hawking radiation" after the famous scientist who died Wednesday— Einstein's birthday. And it painted a completely new portrait of black holes. "Stephen Hawking discovered that when the quantum laws governing the physics of atoms and elementary particles were applied to black holes, the surprising outcome was that black holes actually must emit radiation," physicist Raymond Volkas of the University of Melbourne said via the Australian Science Media Centre. Hawking showed that because black holes give off radiation they actually have a temperature. And in losing mass and energy, they would slowly shrink and eventually evaporate—"a real shock" proposition, according to Sutton. "Hawking's most important scientific legacy is his idea that black holes slowly dissolve like aspirin in a glass of water," said Lisa Harvey-Smith of the University of New South Wales. But Hawking radiation in turn posed a new problem, the so-called "black hole information paradox". If a black hole disappears, all the cosmological information from matter and energy that initially went into it will disappear too. But physics predicts that information can never be lost. Hawking himself had conceded a wager on the point, having initially bet that black hole information will ultimately be lost. "It is still the focus of theoretical interest, a topic of debate and controversy more than 40 years after his discovery," said British cosmologist Martin Rees. A former collaborator of Hawking, he added, once described the radiation theory as causing "more sleepless nights among theoretical physicists than any paper in history." Hawking radiation has heavily influenced the ongoing quest for "New Physics", a "Theory of Everything" that can unify general relativity with quantum mechanics. Besides his deep imprints on theoretical physics, many credit Hawking's popularisation of science, including through his cosmology-themed book "A Brief History of Time", with motivating their own interest and careers. "His impact on the public understanding of science is almost beyond measure," said Harvey-Smith. I will admit I don't understand a 10th of the math he uses but basic physics should prevent a black hole from just evaporating over time (lots of time). Once it reaches a small enough mass that gravity can no longer force disassociation of all the particles of the atoms it ate it should blow up like a supernova I would think. It should act like a huge fusion bomb. It could possibly create some interesting elements too while it was destroying itself. Could someone explain to me why it wouldn't? This is misleading: Einstein did not predict Black Holes and when Schwarzschild solved Einstein's equation and predicted Black Holes in 1916 Einstein at first thought the solution was wrong and even prepared a paper, which was not subsequently published, refuting the idea. He was later convinced by others. @RobertKarlStonjek......here it is, no BHs. Wait'll you see the 1's this post gets from the crowd of geniuses living here who've never seen a Differential Equation they could solve, but who imagine they're smarter than Einstein. "The essential result of this investigation is a clear understanding as to why the "Schwarzschild singularities" do not exist in physical reality. The "Schwarzschild singularity" does not appear for the reason that matter cannot be concentrated arbitrarily. And this is due to the fact that otherwise the constituting particles would reach the velocity of light." "Ever since Albert Einstein published his theory of general relativity in 1915, predicting the existence of black holes, it was thought they devour everything in their vicinity, including light." This kind of slop & swill funny farm stuff is repeated like a MANTRA on this site & in the Comments. Einstein falsifies all of Schwarzschild's black hole math & Einstein is the one who becomes the target of the most derisive slurs . Schwarzschild & his childish black hole math, so simple to understand until you learn some real Nuclear Physics & Differential Equations. Neither the earlier nor today's doctrine understands the structure of the universe, and in particular, does not understand the sequence of the formation and dissolution of celestial bodies. As long as science does not understand and accept the existence of the substance AETHER, which fills the infinite universe, it will never prove any real cause of the phenomenon in the universe. The material is formed of Aether and it is the basis of all existence and occurrence in the material-energy entity of the universe (MEEU). Black holes are places where matter is returned and transformed back into the form of Aether, and these are renewable processes. If science does not know what matter, gravity, and magnetism, and how they arise and who causes them, they will never prove anything precisely. That's why Hawking and Einstein are wrong. Can a black hole form out of dark matter? Dark matter does not exist in the universe. It's Aether from which matter is formed. In the black hole, matter is transformed into Aether, and if Aether implies dark matter, dark matter is formed in the black hole = AETHER. You & Schneibo are brothers, right? Same 19th century cosmology. Your logic is impeccable as usual. You write a stupid comment and predict that you will get scored 1's. When you get 1's, it validates your prediction and in your mind your stupid comment. Ok thanks, that clears it up. The universe is full of matter, like the sea is full of water; evacuate the water from the sea and what's left is vacuum, which is the complete absence of matter, whereas an Aether is substance so is matter, being matter it is evacuated with the water so does not remain, because Aether is not a vacuum. I am trying to get back into the 1970s world of Steven Hawking before all these latest observations of black holes and their spin axis out flows ejecting matter into their star forming Fermi bubbles and LIGOs GW170817 of two orbital black holes in collision proving gravities velocity of light speed. In the 1970s world of Steven Hawking we only had perceptions of black holes, their mystery heightened as they had not then yet been unmasked by today's observations. Consequently try as I might I cannot get back into this 1970s world of black holes. If Matter is transformed into Aether in black holes, your implying matter all ways existed! milnik:- Dark matter does not exist in the universe. It's Aether from which matter is formed. It does not seem clear to you what the vacuum is for science. Science under vacuum implies a space in which there is no matter in any form. Space in the universe does not exist where the absolute vacuum is. Everything in the universe, and even the tiniest subatomic particles, are "submerged" in the substance Aether, which fills the infinite universe. Black holes are places where matter is transformed back in the eyes of Aether. Even the tubes in the particle collisions are not under vacuum, and there is Aether, which no one, never and nothing can remove. Do you now understand what is the vacuum? I am talking about a space in which there is no absolute vacuum, because there is an aether there. And your sea without water is the space filled with air and Aether. Now we come to your valid points milnic "Everything in the universe, and even the tiniest subatomic particles, are "submerged" in the substance Aether, which fills the infinite universe"
This Aether of what you speak, what is it and how was it created, as it is as you point out not matter but a separate identity? What is a vacuum? To answer this question, we must understand that there is a space in which there is something or nothing. But there is no space in the universe in which there is nothing. So there is no absolute vacuum, because the whole universe is filled with Aether. It is a substance for which it can not be asked how it originated and from where. It means that there is a vacuum, which is a space in which there is no matter, in general (and this is questionable), and people usually think there is a vacuum where there is no air or any visible matter. Aether is something that forms matter and it returns to the eye of Aether, and these are black holes. The substance has irreconcilable ties to Aether, which are expressed as gravity and magnetism. Without Aether, there would be no matter in the universe, and therefore there would be no need for there to be a space, and therefore a time which is only a measure of the movement of matter in that space. So there is no absolute vacuum, because the whole universe is filled with Aether. It is a substance for which it can not be asked how it originated and from where. It means that there is a vacuum, which is a space in which there is no matter, in general and people usually think there is a vacuum where there is no air or any visible matter. Aether is something that forms matter and it returns to the eye of Aether, and these are black holes. ShotmanMaslo Ojorf Da Schneib RNP, you guys should feel right at home with this stuff, just name change it to Dark Matter & ENERGY (95% of the Universe), and VOILA = Aether.......by only changing the name you get the same end result. Benny does not have to contaminate the awareness of those who see the difference between Aether and your dark matter or energy. Aether is neither matter nor energy, but has electromagnetic properties and can only manipulate the Spiritual forces, as part of the Spiritual Entity of the universe. What the whole science and many of you, you want to ignore the one who created everything, even our human beings, and that you invented something that only suits you, and it does not matter if Nature and the Creator agree with it. That's why science and its participants will fall deeper into the black hole of ignorance. Does any scientist know what is magnetism and how does it occur? This question also applies to many other enigmas that science has no idea. Ask, I can explain it, but not at this level, but I want to return science to the right path of understanding the structure of the universe. Milnik:- you cannot say that "the whole universe is filled with Aether. It is a substance for which it can not be asked how it originated and from where" You cannot say "It is a substance for which it cannot be asked how it originated" This is why we have got in pickle over dark matter as it does not exist - Fritz Zwicky measured its gravitational mass he could see through it gravitational effects which as it was visible it was not dark matter, but what did fritz Zwicky do, he then declared to world he had discovered dark matter! And do know why that did that; because he could not physically see it with own his eyes! There is an absolute in physics which is you can always ask where it originated and where! Even if you cannot immediately get an answer otherwise if cannot ask you will never get an answer and you will always be able to prove a fallacy! People who do not know the structure of the universe always ask: how and from what is the origin of what we are talking about and so on for ever. There seems to be a limit beyond which we are not able to understand, and especially we ask questions because we do not understand anything else. Again, I repeat, AETHER j substance under the control of the Spiritual Entity of the universe. This is opposed to science because it thinks that this attitude belongs to religion. It is a proof that science does not know what religion is and what is true. The spiritual entity of Aether forms matter and all its properties and science will be increasingly stupid if it ignores it, because then it knows nothing about itself or the universe. Many questions of interested persons on the question of the layman: If God is omnipresent, can he form a stone, which he can not raise? You ask such questions if you do not understand something. The spiritual entity of Aether forms matter and all its properties and science will be increasingly stupid if it ignores it, because then it knows nothing about itself or the universe. In India itself there are more than 600 religions. And what is religion? People with a great influence on the masses of the people use the power of all the phenomena that they do not understand and depict them to a single deity or to God who is their representative, and with that deity people are inclined to obey. And today's science is a new scientific science, which invents its deities to be trusted. You, virtually all of you are taking Einstein for the deity and his relativity theories are the Gospels that you constantly read and apply in all situations. There is truth in the universe, the only one and the power of forming everything from matriarchs and energies. This is performed by the Spiritual Entity of the universe. Whoever does not respect this, this is a forgery in a bunch of human beings. In religion quantity is not diversity, and they are all metaphysical, they are not real, they exists for the same reason, to take your money and your well aware of the ancient relics that have survided 1000s of years destroyed in of religion. Which proves the there created by men for power over populations! In India itself there are more than 600 religions. You, virtually all of you are taking Einstein for the deity and his relativity theories are the Gospels that you constantly read and apply in all situations. A tentant of religion is power over people and you have exemplified it in your statement! milnic:- This is performed by the Spiritual Entity of the universe. Whoever does not respect this, this is a forgery in a bunch of human beings. Do not equate Spirituality with metaphysics. The Spiritual Entity of the Universe (SEU) has formed all the phenomena and all laws in nature that matter from the very beginning of formation, to all the processes from which everything is formed from matter. Science must one day understand that it does not interfere with what the SEU has formed and to disprove it because it does not respect the existence of the SEU, because SEU is not a police officer who leads ignoramuses to the trial. The SEU gives us human beings the opportunity to try out everything that is good and what is not free and voluntarily do according to the level of our consciousness. Such transformation is renewed until our conscience gets the necessary level of understanding of everything in the universe, and then our Soul becomes the holographic point of the Absolute consciousness of the universe. Then we will not possess any of the matter, because it is the Spiritual Entity. We have heard of superstrings, darkenergy, even darkmatter; but we have not heard everything until we see an elephant fly because we now hear of the conscious universe! milnik:- the Absolute consciousness of the universe. The universe, as the sphere of an infinite diameter, is two entities. The fundamental and creative entity of the universe is the SPIRITUAL entity of the universe (SEU), which is the unlimited power of forming everything from matter, and matter is formed from the substance AETHER, whose existence is ignored by science, and therefore requires solutions, such as the hideous corn grain of corn. This power is the action of the Absolute Consciousness of the ACU universe, which is the overall state of all knowledge and memory that the SEU has. And we, human beings, are two entities: our SEU is our soul, like a particle or a spark from the SEU, and our MEEU is our body. Our Individual Consciousness has that level of understanding of the cause of the phenomenon, as far as we are closer to ACU. Our Intuition is the link current, our IC with ACU. Who knows and does not accept it, it is at a low level of understanding of the structure of the universe. We are rapidly creating robotics in our image milnic, the day is arriving when family's of robots are growing up together amongst their human counterparts. As you seem to think a collection of atoms gives people souls making robotics in our image endows them with the same soul that the atoms are endowed with! The SPIRITUAL entity of the universe (SEU), our SEU is our soul, like a particle. it is not good to give ratings and make conclusions about something you do not have a clue or any contact. Where did your soul escape when you ignore what every conscious human being needs to grasp.? milnik you are discussing a reality of life that every knows the answer to, no one knows more about the soul of nature's creations. By nature creating life from the ingredients at hand for that life to have a soul, nature's ingredients of construction have a soul, we are a collective of souls. Robotics created by nature creations from natures ingredients also are a collective of souls and consequently have what we perceive to have, a soul! Religion is a personal non factual belief which is separate from factual science. milnic:- mixing factual science with a personal non factual belief is a recipe for science becoming a belief and belief becoming fact which is a recipe for disaster, which leads to the following - unless less of course milnic you do not believe the ingredients of life have souls, and we are a collective of soulless ingredients destined to go back to the ingredients of the vacuum of space as dust to dust ash's to ashes, soulless in life as in death. This is why milnic religion is a personal and is kept personal. you mingled science, religion and some indeterminate philosophy. You and science want to learn something you do not believe in and want to explain this phenomenon in the same way as your level of awareness. If you enter the domain of the Spiritual Entity of the universe and there you want to establish your dictatorship and determine that the universe behaves the way you see it, it is absurd. I see that you do not even understand religion. What I am saying and referring to is: Spiritual Entity, Soul, Creator (God), this is not a religion, because there is only one Spiritual entity, one God and one Soul (in a human being). If you do not want to realize that you have a Soul and you do not understand it, it's not something dangerous, because through several incarnations, you will realize that you were uninformed about it. This should be the basis of science, not the nebulosity and fabrication of compassionate and soulless "experts." Miss-attribution is unhelpful and wholly misleading.I doubt that it really helps either side. Hubble was an expansion sceptic and became ever more vocal over time listing, in his last published work, a list of reasons why the expanding universe hypothesis was wrong.The reasons he listed turned out to be wrong but initially, including before the famous 1929 paper, he voiced his opinion that there must be some other mechanism for the observed redshift. & Einstein never fully accepted Black Holes, then accepted them but rejected the singularity and took that belief to the grave. Schrödinger thought that his equation was an approximation that would be clarified into exact determinism when a finer scale could be observed.He proposed the cat thought experiment to show how untenable the idea of superposition actually was. The papers & articles written by these people in which their opinion is expressed are publicly available, yet the exact opposite is portrayed in the media.Why? Maybe. Because black holes contain no matter in their singularity. The matter it swallows is converted back to energy and emitted through wormholes to form white holes, perhaps. But how could they maintain their gravity if they have no mass? Because to keep the singularity open you have to conserve the pressure differential between outside the BH and the singularity. The singularity is locked in until the BH evaporates. Problem is people are bound to their mass/gravity notions.